I’ve been doing lots of cooking and taking photos, but most of it, lately, is hardly worth mentioning, sad to say. But if you just close your eyes and scroll down past the mediocrity, there’s a really awesome pasta dish at the end for your troubles! This eggbaby, which I made for breakfast last Saturday, looks pretty enough in the picture, but it came out thick and dense and bland. 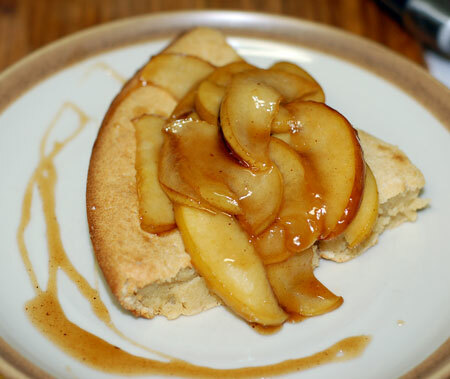 The sauteed apples were the only bit that made it edible for me, although Jeremy was sweet enough to eat three slices. 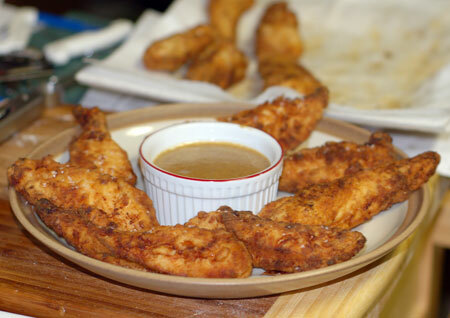 I made some fried chicken fingers, brined in buttermilk, earlier in the week, and they tasted fine dipped in milk gravy, but they weren’t anything special. 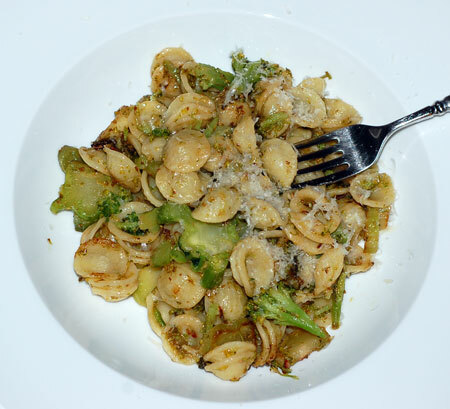 I’ve made this orecchiette with broccoli and anchovies once before, and we both really liked it (it comes from Essentials of Classic Italian Cooking , of course), but this time it just wasn’t very good. Right or wrong, I blame the broccoli. Actually, it was so pitiful that we bought a German chocolate pie from Marie Callender’s to console ourselves. Ah, but here’s the bright spot in this otherwise mediocre menu. It may not look like much, but what you see above is a version of my ultimate comfort food. It’s a recipe I got from my aunt in Oregon City, who said it was adapted from a noodle dish made by a Thai friend of hers. In its current incarnation, it could hardly be farther from a Thai dish, but that doesn’t bother me one whit, because it’s noodles with eggs and bacon, salty-sweet. I believe the original involved shrimp rather than bacon, and quite possibly rice noodles, served with a vinegar-marinated cucumber salad, and every so often I wonder if I could reverse engineer it based on the description. But I like it so much this way, I never have. The recipe below isn’t so much a recipe as a guide, as I never measure any of it. Just wing it until it tastes good to you. Still, such as it is, it’s my entry for Ruth’s Presto Pasta Night #29, if I’m not already too late. I have no idea if that name is spelled correctly, so if I’ve botched it terribly, I apologize. I have always made this with wide egg noodles, but we ran out of them, and Jeremy has recently developed a serious egg-noodle prejudice for which I have no explanation. So I’ve used Barilla Plus rotini the last few times and it is just as good a meal, if farther than ever from its Thai roots. If you use these noodles, you may need to go heavy on the seasonings, so taste and adjust a bit more. When the pasta is done, drain it thoroughly, and dump it in the skillet with the hot bacon fat. Stirfry it for a few minutes over medium high heat, until it’s lightly coated in the bacon fat and just a bit browned and crisp in spots (if that’s how you like it; I do!). Add a few glugs of soy sauce and stir it around; the sauce should lightly color the pasta. You can always add more later, so don’t be too heavy-handed at first. Next add about 2 tsp of sugar and stir that through, with a few grinds of pepper. Taste a noodle and adjust the soy and sugar balance if you need to; it should taste lightly and proportionately salty and sweet (the sugar mostly keeps the soy flavor in check). When it tastes good to you, add the bacon and garlic back with the noodles, and stir fry for another minute or so while you beat the eggs. Spread the noodles out a bit so they aren’t all mounded up, and pour the eggs right over them. Give it a minute or two more to set, then stir it vigorously and keep stirring until all the egg is cooked. The amounts in this recipe are all adjustable. 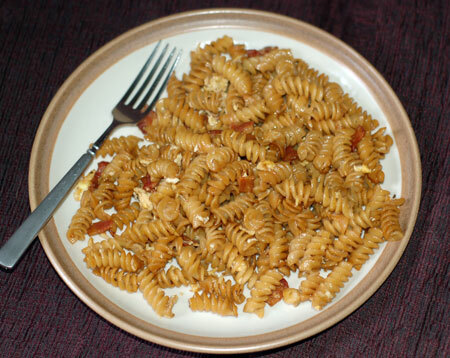 I used to make it for myself when Jeremy was in school and I just used a single egg, 2 slices of bacon and less pasta. The amounts I’ve suggested above makes a big plateful each for two people, or maybe three if they can all show some restraint. Never too late to share a great Presto Pasta Night dish! Thanks for sharing and it will be in PPN #29!